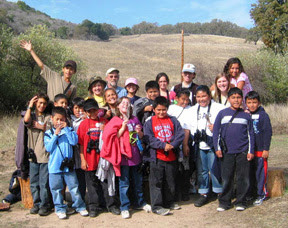 Continuing our work with CMS, Craig Hohenberger, Pat Stadille, Tanja Roos, Merrie Potter and Amy Thistle worked with 18 children from the Salinas and Seaside Boys and Girls Clubs for a day-long (9am-7pm) "Biodiversity Camp". 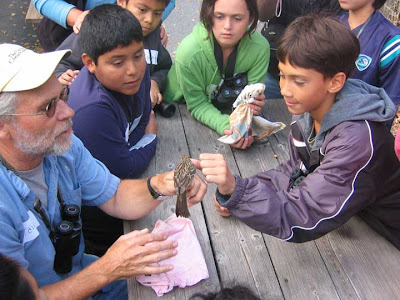 This camp is part of the program offered by the Habitat Program at the Carmel Middle School, and we are pleased to have the biodiversity camp here Saturday, Oct 27. Hastings has been involved with the Habitat program at Carmel Middle School since its inception and you can read more about the program here. The Habitat's Fall Biodiversity camp at Hastings was an absolute success! The students were exposed to an abundance of hands-on activities. Throughout the day, students checked mist nets, studied and released many species of birds from around the surrounding habitats. They also hiked all over the property to observe lizards and snakes, collected specimens, watched tarantulas, made sketches and photos for a keepsake, handmade journal. The day concluded with all the students participating in cooking and enjoying a seasonal and healthy meal together in Hastings well-equipted classroom facility. All the students left with smiles on their faces and great memories of a day in nature!